Today, we are going to tell you about one of the unique railway crossing's in India. Railway crossing, as you must be aware of, is a place where people cross railway tracks to go to other side. Indian railways, and many railways across the world, provide some infrastructure at such crossings to ensure safety of people while they cross rail tracks. This is usually done by fitting couple of gates at either sides. The railway crossing gates are opened and shut by a railway employee called - 'Railway Gate Man'. These days many of the crossings are equipped with automatic gates that can operate without the presence of a human being. But still there are many such crossings in India where gates are opened and closed by a human being i.e. a gate man. One of such manually operated railway crossing lies in state of Punjab in India. But it is unique. You must be wondering what could be unique about a railway gate/ crossing? Well, while this crossing of railway is manually operated, railway has not assigned any gate man to do the job. So, what happens when a train comes? Does the gate remains opened and traffic keeps on passing over the railway tracks through the gates? Who ensures the safety of people. We can tell you that not a single accident has been reported yet. 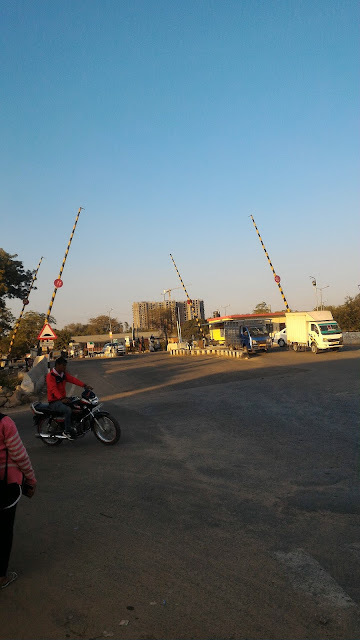 This is where this indian railway crossing is unique. When a train comes, both guard and driver (locomotive pilot), jumps down the train and close gates one by one, before they cross the gates. Where this crossing is located? This railway crossing in India is located just before the station Romana Albel Singh. Crossing number 21 is the one where this unique thing happens. Problem can be solved immediately if railway can allocate a staff here. And there are many jobs in railway available, but recruitment of linemen and gate men hasn't been done for many years. Locals believe that it is due to internal fight between officials of two railway departments in this region which is the cause of all the mess. Due to lack of employees, both department argue with each other, and ignore allocating a staff at the crossing. We hope that railway take note of this situation and provide solution as soon as possible.